Tin mine between Cambourne and Redruth, Cornwall, c 1860. Minerva racing car, c 1912. Zinc mine, Neutral Moresnet, 1855. Separating silver from gold, 1580. Gold testing for silver, 1580. 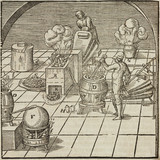 Separating gold from mercury, 1580. Pullman car Pegasus Bar interior, 1951.